The Uncurated Life: Love is in the air with WeChat GunzDash | Win an iPad Air! 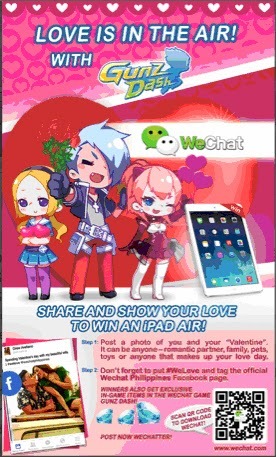 Love is in the air with WeChat GunzDash | Win an iPad Air! I plan too cook a special dinner for him and treat him to a night of relaxation at his favorite spa place. If you still have no clue what to do this Valentine's, WeChat has come up with a special giveaway for you and your lovey. Read on and find out how to join and make your mark this coming Valentine's Day! This February 10-16, everyone is invited to post a photo with a “Valentine” on Facebook, which include the tags #WeLove and @WeChatPH. Now, this “Valentine” doesn’t necessarily have to be a significant other. It can be a family member, a pet, or just about anyone or anything dear to you. The Most Popular Photo, which will garner the biggest number of “Shares” and “Likes” will get to take home an iPad Air. While on the other hand, the Most Creative Photo, the Sweetest Photo, and the most Touching Photo will garner 1,000 diamonds on Gunz Dash. Don’t miss out on this chance of winning these prizes so snap away! WeChat is an innovative mobile social communications application designed for smartphone users. WeChat is free for download from app stores running on iOS, Android, BlackBerry, Symbian and Windows Phone operating systems*. It is the most downloaded mobile social app in many markets, with more than 100 million registered accounts in international markets. WeChat users can add friends via a wide range of innovative actions and methods, including scanning QR codes, connecting users’ phone books and activating location-based functions such as “People Nearby” and “Shake”. The platform enhances social interaction by supporting exchanging of text, voice and video, stickers, and photos with their friends over data networks or under Wi-Fi environments. Users can choose to communicate one-on-one, or within their closed social network through “Moments”.